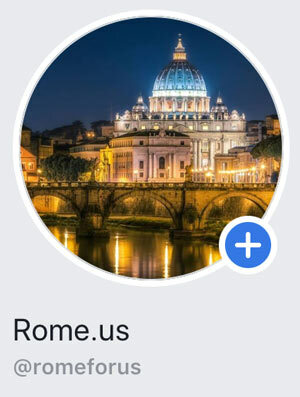 The Papal Basilica of St Peter in the Vatican (Basilica Papale di San Pietro in Vaticano) or St. Peter’s Basilica is an Italian Renaissance church located in Vatican City. It is the papal enclave inside Rome. The church was designed by famous architects as Donato Bramante, Michelangelo Buonarotti, Carlo Maderno, Raphael, and Gian Lorenzo Bernini. The basilica is considered as one of the holiest shrines in the world, but it’s not the mother church of the Catholics nor the cathedral of the Roman Diocese. Importantly, the church is the burial site of Saint Peter, the main person among Jesus’s Apostles and the first bishop of Rome. Its tomb is supposed to locate below the high altar of the Basilica. 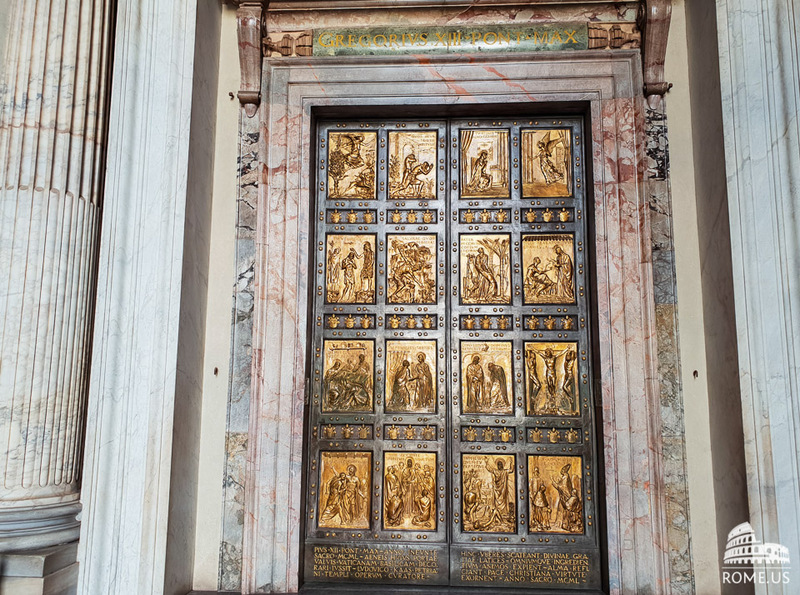 In addition, most of the Popes have been interred at St. Peter’s starting from the Early Christian period. Moreover, on this spot has been a church since the period of the Roman emperor Constantine the Great. The event of the crucifixion of Jesus is recorded in the Biblical book of the Acts of the Apostles that one of his twelve disciples. Saint Peter or Simon was a fisherman from Galilee. He took the leading position among Jesus’ followers and became the main reason in the founding of the Christian Church. The name Peter was given to Simon by Jesus, which means “stone” or “rock” in Greek. On the place of current basilica was once a chariot racing stadium from the time of the Emperor Caligula, Claudius, and Nero (1st century AD). Moreover, Nero was the Emperor who began the great persecution of Christians in Rome. His rule of terror led to the imprisoning of many Christians and put to death on this place in his “circus”. Among first Christians who were surrounded by his soldiers was Saint Peter. Most probably, he came to Rome about the year 40. Many Christians of that time were thrown to the wild animals and it was considered as the part of entertainment in the stadium. 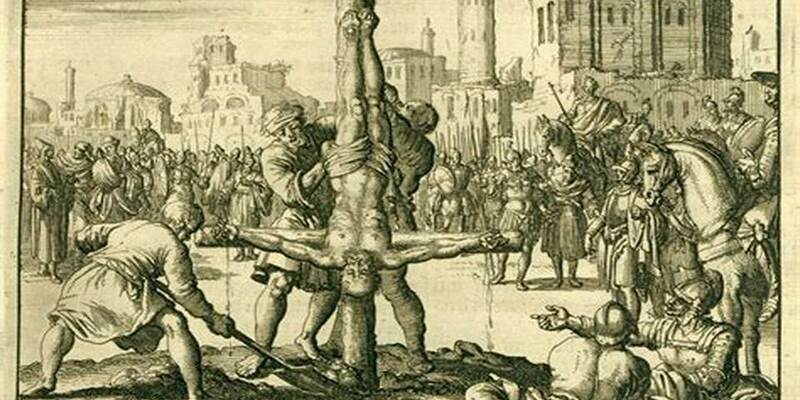 However, many of them were crucified. There was a wall which divided the arena of the circus, so that the chariot races took place around them. The circus of Nero was about six hundred yards long. Moreover, Peter was crucified head downwards, by his own request because he thought himself to be unworthy to die in the same manner as Jesus. 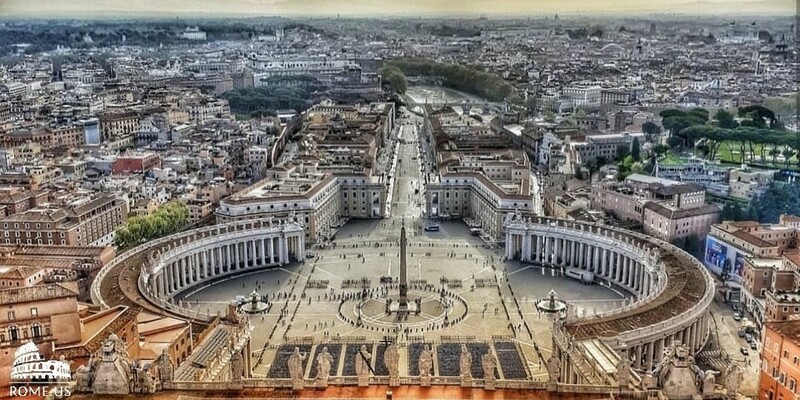 The crucifixion took place near an ancient Egyptian obelisk (one of thirteen obelisks of Rome) in the Circus of Nero, located now in St. Peter’s Square. Construction of the present basilica, which replaced Old St. Peter’s Basilica from the 4th century AD, began on 18 April, 1506, until 18 November, 1626. The Pope of the time, Nicholas V, commissioned restoration of the basilica to Bernardo Rossellino, who wanted to demolish the old church and build a new one. Pope Nicholas V approved the idea, but he died soon after the beginning of its realization. The 7 popes that succeeded him decided to enrich the existing building. At the beginning of 1500’s, Pope Julius II commissioned Michelangelo to sculpt his tomb, so that the sculptor created a large, pyramid-shaped monument. The Pontiff liked the masterpiece, but there was not enough space inside the Constantinian church for such a huge tomb. 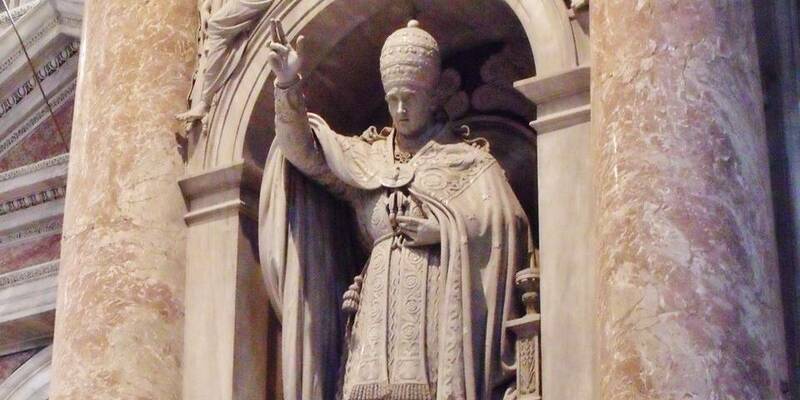 Creating enough space for the funerary monument became one of the main reasons that led Pope Julius II to commission building of the new Basilica. Consequently, Bramante was the architect responsible for the project. The building process became in 1506, but between 1513 and 1514 both Pope Julius II and Bramante died, leaving the construction with 4 enormous pillars for the dome supporting. The next pontiff, Leo X, commissioned Raphael to continue the project, but the young artist died at the age of 37, and his project wasn’t realized. Importantly, Raphael’s Basilica was to have a Latin-cross shape with an interior’s features composed of the play between light and shadow. After the death of Raphael, Antonio da Sangallo became the chief architect of the Fabbrica di San Pietro from 1520 to 1546. However, the church had economic difficulties at that period of time. 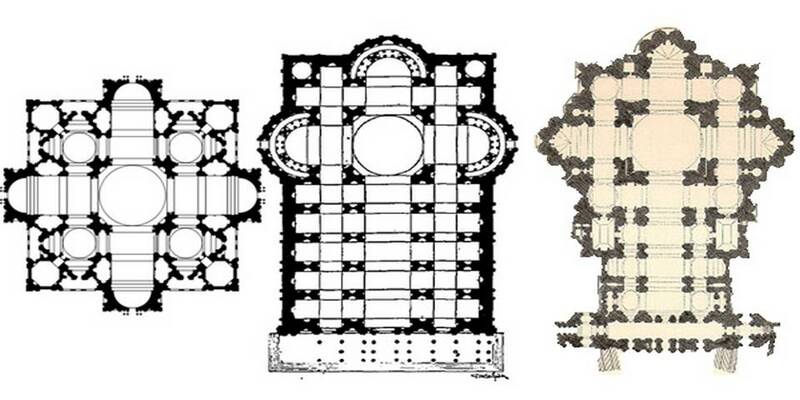 Sangallo continued to work on Bramante’s floor plan to cover the surface of the old Basilica. According to the project, the area planned to become a sacred ground, and Leo X wanted to include it in the new building. For this aim, the master positioned the façade between two bell towers and connected them to the main building of the church by a vestibule. Later, at the request of Pope Paul III, Sangallo created a wooden model of the project of 4,5-metre-tall, which took 8 years to create for the price of a real church. Nowadays the model is in one of the Basilica’s octagons, located above the four large corner chapels. After the death of Sangallo, Michelangelo Buonarotti succeeded him. The Florentine artist was over 70 years old and refused the offer of working on the project several times, until Pope Paul III forced him to accept it. Michelangelo did not really like the work of his predecessor and decided to demolish several parts that were built before his coming. The master returned to Bramante’s original plan and designed an enormous dome (cupola) as the central element of the new construction. Michelangelo was inspired by the cupola of the Duomo of Florence and the Pantheon, designed by Brunelleschi. When he died, the new Basilica missed the corner chapels, the façade, and the cupola, of which only the columns and drum had been finished. In 1587, Giacomo della Porta became responsible of completing the dome with his assistant Domenico Fontana. After two years of work, the cupola was finally completed. The project passed into the hands of Carlo Maderno in 1603, when there was still a counterpart of the Old Basilica. Moreover, there were many people who opposed the demolition of the Old Basilica. However, Pope Paul V decided to remove the old walls, while Maderno extended the eastern wing of the new building, thus covering the surface of the old church. This reconstruction led to the positioning of the façade in a much further forward. Thus, to connect it to Michelangelo’s masterpiece, Maderno constructed a 3-naved structure. This is the main reason why the New Basilica acquired a Latin-cross shape. According to Michelangelo’s project, the cupola was located much further from the entrance. The façade was too flat for the dome to remain stable and it was framed between two bell-towers. Moreover, Bernini and Maderno succeeded in constructing the towers, since the main soil was too soft. Today, Saint Peter’s church is worldwide known place of pilgrimage and liturgic functions. The Pope is a chairman of liturgies that take place throughout each year and draw audiences of 15.000 over 80.000 people, either inside the Basilica or in St. Peter’s Square. Moreover, the basilica considered as the greatest masterpiece of its age. 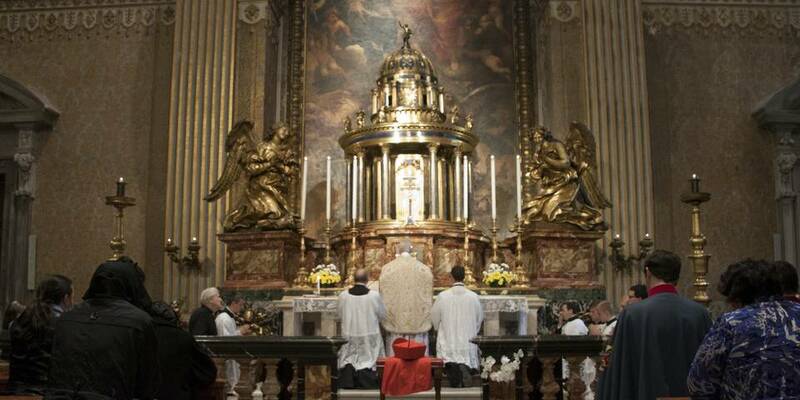 It is one of the four churches in the world that hold the rank of Major Basilica, all of them located in Rome. However, it is not a cathedral since the basilica is not the seat of a bishop. The cathedral (Cathedra) of the Pope as Bishop of Rome is in the Archbasilica of St. John Lateran. 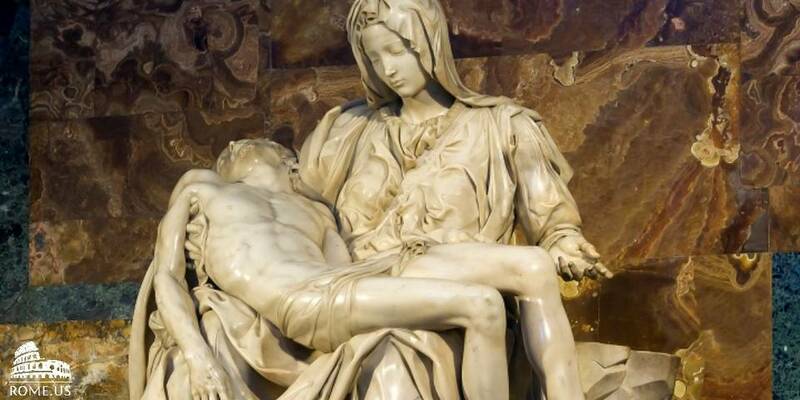 Undoubtedly, the Pieta by Michelangelo is one of the main features of St Peter’s Basilica. The masterpiece was created when the artist was only 24 years old and became the main reason to make him famous. The statue was commissioned for the French Cardinal Jean de Bilheres. It is located in the first chapel on the right side of the basilica, right after you enter it. Monument to Leo XII was made by Giuseppe de Fabris in 1835-36. It represents the pope standing and imparting his blessing Urbi et Orbi during the Jubilee of 1825. Moreover, behind the statue, are the heads of four of his cardinals. Chapel of Saint Sebastian is the project by Pier Paolo Cristofari, who executed Domenichino’s painting into mosaic and was the Director of the Vatican Mosaic Studio from 1743-1755. Moreover, he worked on many of the altarpieces in St. Peter’s. 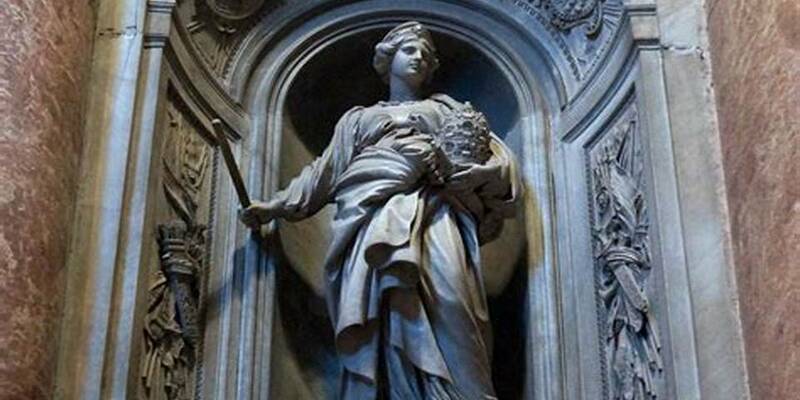 The monumental tomb of the countess Matilda of Canossa was made by Gian Lorenzo Bernini and his workshop (1046-1115), includes a sarcophagus carved with the Submission of the emperor Henry IV to Pope Gregory VII at Canossa, an inscription held by two angels, and the sculpture of Matilda. There is a sign in front of the Blessed Sacrament Chapel: “Only those who wish to pray may enter”. 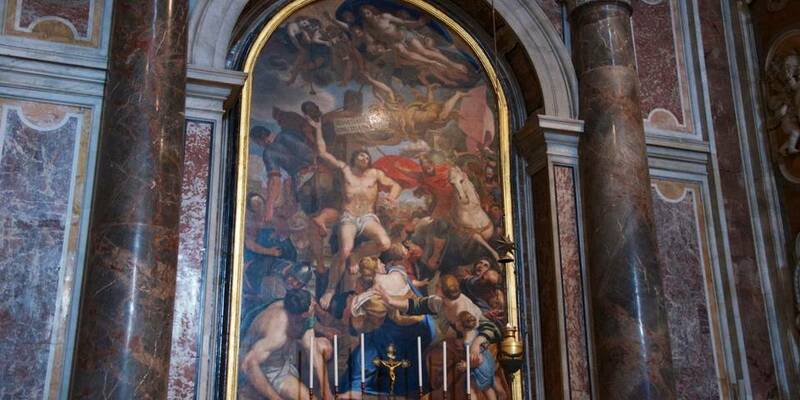 It is exposed in front of a tabernacle designed by Bernini. 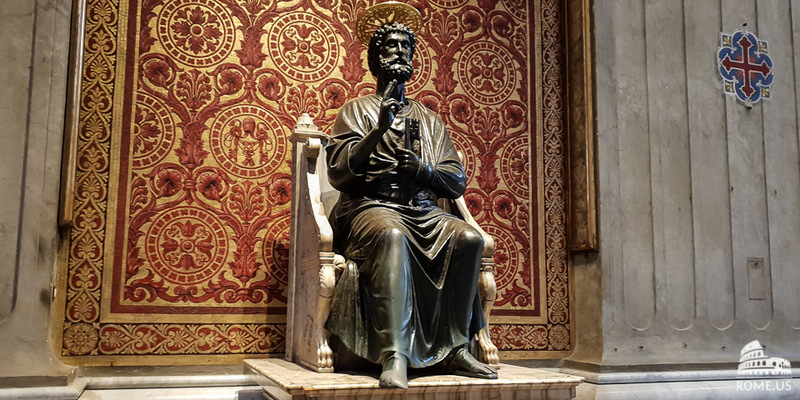 The bronze statue of St. Peter has his right toes worn down by centuries of pilgrims and visitors of the Basilica who touch and kiss the foot. This tradition comes from the Middle Ages, when the pilgrims prayed to Saint Peter asking to open the gates of heaven if they die during the pilgrimage. The statue represents him blessing and preaching with the keys to the kingdom of heaven held in his hands. Scholars attribute the statue to Arnolfo di Cambio (13th century), but there are many historians who believe that it is from the 5th century. Interestingly, behind the statue is a mosaic, which seems as a fine brocade draping. 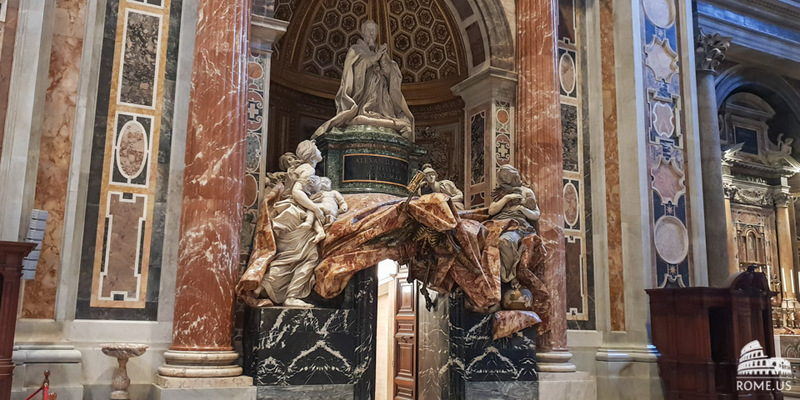 The tomb of Fabio Chigi, Pope Alexander VII, is the masterpiece by Bernini. It is set in a niche above a doorway into a small vestry, but Bernini has used the doorway in a symbolic manner. Pope Alexander locates upon his tomb. The tomb is supported by four female figures, but only the two of them are fully visible and embody Charity and Truth. Moreover, the foot of Truth locates upon a globe of the world, where her toe is pierced by the thorn of Protestant England. Also, there is the skeletal figure of Death, which right hand carrying an hourglass. The Baptistery Chapel was designed by Carlo Fontana. Moreover, it has the main altarpiece made from an original painting by Maratta (1698). The central space of the cathedral is limited to four pillars supporting the dome. This part of the temple was implemented in accordance with the project of Michelangelo. In the heart of the church you can see a lot of mosaic paintings, made according to Domenichino sketches. In this part, there is the memorial of Pius VII, made in the 19th century by a non-Catholic artist – Bertel Thorvaldsen. St Peter’s Cathedral has a Gregorian Chapel (Gregoriana Cappella), dedicated to the creator of the Gregorian calendar which we use nowadays. The tomb of Saint Peter is located under St Peter’s Basilica near the west end of a complex of mausoleums dated between 130 AD and 300 AD. 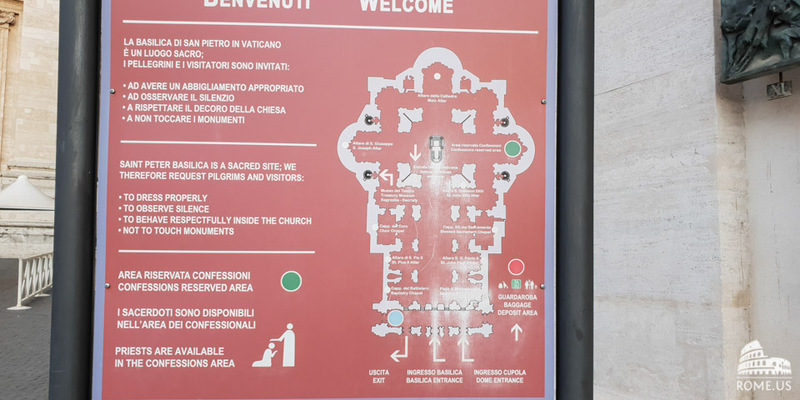 People with the special permission are allowed to go down to the tomb and pray as close as possible to the body of Saint Peter. There are four large statues of saints at the center of St Peter’s church associated with the basilica’s primary holy relics: Saint Helena holding the True Cross and the Holy Nails. The statue was created by Andrea Bolgi. 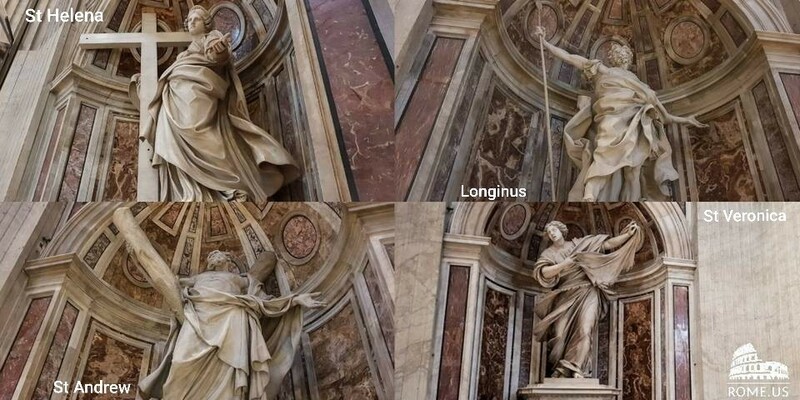 Another statue is of Saint Longinus, who holds the spear that pierced the side of Jesus. This important art work was created by Bernini in 1639. On the opposite side is Saint Andrew with the cross, which was created by Francois Duquesnoy. Finally, Saint Veronica’s statue and her veil with the image of Jesus’ face is located in the central part of the basilica and is made by Francesco Mochi. At the center of the basilica, above the altar, stands the bronze Baldacchino (canopy) designed by Bernini during the Baroque era. As mentioned above, when the Basilica had been finished, there was no connection between the main body designed by Maderno and Michelangelo’s cupola. 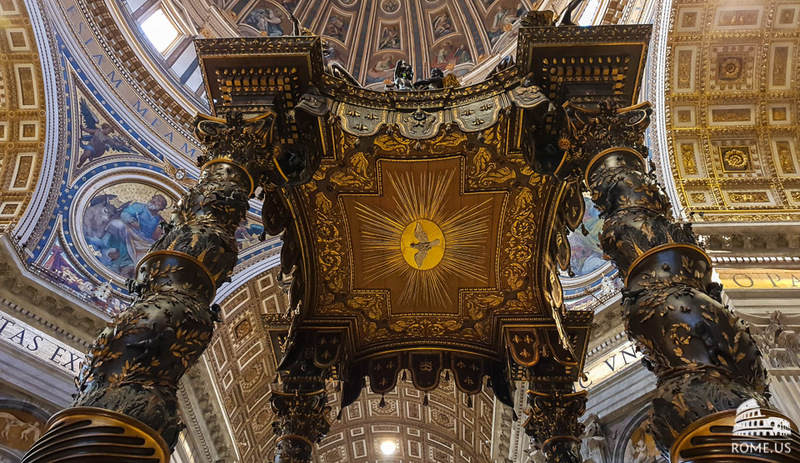 So that Bernini came up with an idea to create the baldacchino and place it right above the tomb of Saint Peter. Under the canopy is the high altar of the church. Also, the project was commissioned by Pope Urban VIII, and the work began in 1623 until 1634. The Holy Door is opened in certain years ‘Jubilee years’. Moreover, the one who passes through the door receive a plenary indulgence. 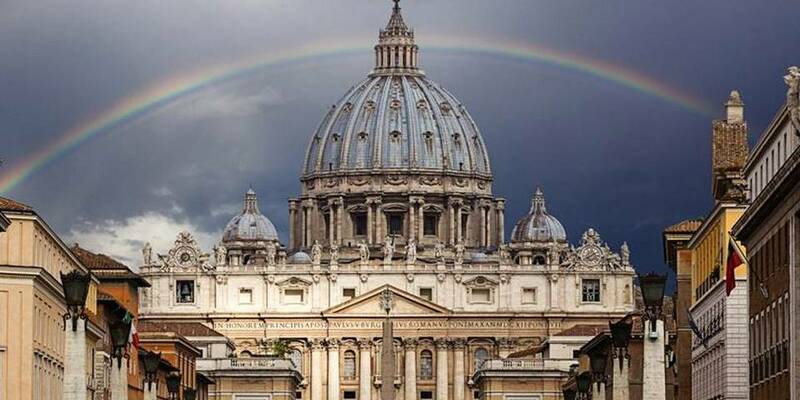 Don’t miss an opportunity to visit the Vatican, when it will be opened again in 2025! The dress code to Saint Peter’s Basilica is the same as in any church in the world. You have to cover your knees and shoulders. Moreover, don’t come drunk or don’t bring alcohol (you can take a bottle of water with you inside) and remember that it is not allowed to talk loudly inside the church. The same dress code works with the Vatican Museums.